When you become a Member of Nascentia Health Options, you’ll have access to the medication management that you need. Nascentia Health Options offers a healthcare plan for Medicaid beneficiaries living throughout New York State. At Nascentia Health Options, we understand that properly taking your medications can be confusing, especially if you’re faced with new or multiple medications after hospitalization or surgery. Proper management of medications is important to your health condition. That’s why we offer medication management as part of your managed long-term care (MLTC) plan. Nascentia Health Options will provide you with a nurse who has been specially trained to teach you how to manage your medications and will help you set up a system to take them on a daily basis. This may include a nurse pre-pouring medications or assisting a patient or family member in setting them up. The goal is for each client to be as independent as possible taking his or her medications while ensuring all medications are taken as the physician has ordered. 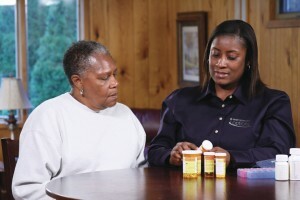 These medication management services are offered as part of our managed long-term care (MLTC) plan, which includes in-home and long-term healthcare for our Members. Find out if you are eligible to join and become a Member.